It's that time of year where we try to forget about all the high-calorie goodies we stuffed into our mouths during the holidays and start anew. It's the season of trying out new diets, some of which yield success on the scale but hunger pains in the stomach. Many try to drastically restrict calories to lose weight, but research has shown that this merely slows metabolic rate, making it harder to lose the pounds. Instead of concentrating on what not to eat, focus on foods that are nutritious and appetizing. Here are five low-calorie foods that will fill you up, helping you to eat less. Broccoli. Fiber keeps you feeling full and when it comes to broccoli, there's plenty of it. One cup chopped and boiled has about six grams of dietary fiber. If broccoli's not your first choice of veggies, try Brussel sprouts, collard greens or acorn squash, all of which are loaded with fiber. Raspberries. Just one cup of raspberries has eight grams of dietary fiber. Buy them frozen during the winter months and use in smoothies or on top of oatmeal or whole wheat pancakes. Lentils. These legumes lead the way in fiber content. One cup boiled has about 16 grams of dietary fiber. Compared to dried beans, lentils are relatively quick and easy to prepare and ready in 20 to 30 minutes. Use in hot soups or cold salads. Eggs. 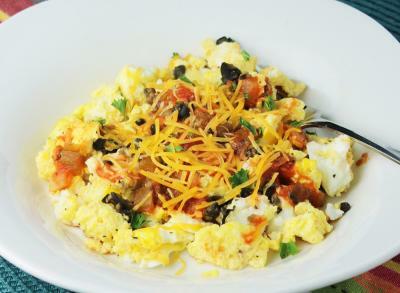 Research suggests that a breakfast of eggs will keep you satisfied all the way to lunch. Protein will also help curb the appetite, and eggs are a great source at six grams per egg. Eggs are a low-cost, quick and easy to prepare. Almonds. Any nut will do really, but almonds are especially high in protein and fiber (one ounce yields five grams of protein and 3 grams of fiber.) A handful for a snack will get you through to the next meal. Spray microwave-safe dish with non-stick cooking spray. Whisk eggs in medium bowl. Add milk; whisk. Pour mixture in dish, cover and microwave on high for 4 minutes. Remove lid and use fork to scramble eggs. Top with salsa, olives and shredded cheese.